Been diving in New Zealand? Please Vote! New Zealand is a gem composed of natural beauty, adventure and sights that ignite sheer wonder both above and below the surface of these waters in the south-west Pacific. Boasting 14,000 kilometers of magnificent coastline and an impressive variety of underwater life, New Zealand is simply a fantastic holiday destination for scuba divers and adventure seekers. Diving in this magnificent country can be roughly divided into North and South island destinations, with the North Island offering spectacular beaches and great sub-tropical reefs and the South Island boasting entirely unique underwater topography. The majority of dive spots are easily accessible and vary widely in their offerings so that there is always something to please every diver. Many diving highlights are found in New Zealand including wrecks and the famous Poor Knights Islands, named by diving guru Jacques Cousteau as one of the top 10 dive spots in the world. Without question, New Zealand’s most famous diving spots can be found in the north of Auckland at the Poor Knights Islands. Having been a protected marine reserve since 1981, this subtropical reef system shaped by volcanoes is in pristine condition and boasts a wide variety of sea life. A hugely popular site at Poor Knights is known as Middle Arch, and is easily accessible for divers with any range of experience. Even beginner divers can enjoy the wonder of Middle Arch thanks to its shallow depth range of only 10-16 metres. Divers have the chance to see rays, moray eels and large wrasses amongst the beautiful setting. For more advanced divers, the Northern Arch is well worth exploring, especially to try your luck at spotting the pink maomao or even a giant kingfish. New Zealand boasts a number of exciting wreck sites and some of these are conveniently located close together around other north island sites. The Greenpeace Rainbow Warrior is one of the most famous wrecks in the world and was laid to rest by French foreign intelligence in 1985. The vessel, once the flagship of the Greenpeace fleet, now lies at the depths of Cavalli Islands. For those just beginning their wreck diving adventure, the purposely-sunk Waikato is a great place to start. With big holes cut along the sides of the vessel and at manageable depths of between 8 and 30 metres, divers can enjoy easy access to the interior of the vessel and can explore the variety of marine life that now call this vessel home. Goat Island is another “must-dive” spot north of Auckland. A wide variety of interesting habitats and underwater topography can be found within this marine park. Reefs that are teaming with marine life, kelp forests, rocky cliffs and seagrass beds are all on offer here with an unbelievable variety of marine animals to see in each habitat. Crayfish and blue cod are regular sightings around Goat Island too. Divers can choose to enter from the shore at Waterfall Reef but if arriving via boat should also check out North Reef to Moki Haven. 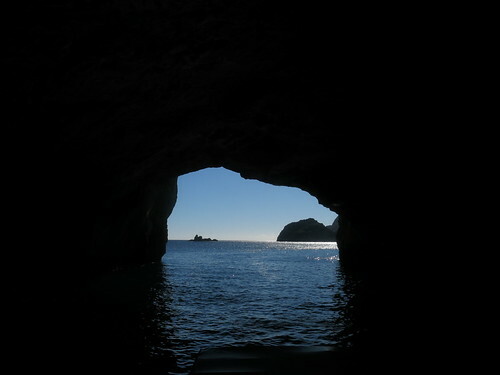 Another site with great underwater topography, this area boasts caves in addition to kelp forests and sponge gardens. New Zealand’s South Island is home to a rocky coastline, temperature waters and superb diving. Diving is very popular around Kaikoura in the north of the South Island, where divers can experience an array of pelagics including dolphins and whales. With large kelp forests and a fantastic limestone reef, divers can also see crayfish, starfish, seals and octopus as well as colourful anemones and sponges. Due to its isolation, Bushett Shoals is one of Kaikoura’s best dive sites, attracting an abundance of marine life. Further south, the New Zealand Fiordlands offer something truly unique. For many, this area really captures the essence of New Zealand with its dramatic landscape and interesting underwater life. Milford Sound is one such site that needs to be seen in order to be believed. The underwater landscape is phenomenal and it is interesting to note that you can find an array of deep water species in much shallower waters here. Species such as saucer sponges and black coral which are usually found at depths of 100 metres have been forced to move closer to the surface of the water as the high mountains of this area block a good deal of sunlight from the water. To gain access to some of New Zealand’s best diving such as sites around the Poor Knights Islands and the famous Waikato wreck, divers should opt to fly into the main city of Northland which is Whangarei. The North Island also hosts the Auckland International Airport, accepting daily flights from a wide variety of international destinations. Queensland Airport is another airport that is well-connected with internal New Zealand airports has well as international destinations. Diving operations are on offer in both the North and South Island, with planned daily diving trips, equipment hire and dive training on offer to cater for every diver’s need. Some operations even offer fiordland tours, with memorable dive experiences at the end of the scenic drive and boat cruise. Diving in the North Island of New Zealand is best done during the winter months which fall between May and September, although diving is also very popular from January to June during the summer and fall. Although the water can dip down to a frosty 14°C in winter and may require at least a 5mm or even a 7mm wetsuit to remain comfortable, the visibility is superb during this time and can be in the range of 15-30 metres. Summer water temperatures can rise up to 26°C. Further south, the South Island of New Zealand has even colder water temperatures, usually between 11-15°C at the Fiordlands. Divers are recommended to make use of a 7mm wetsuit here, and many opt for a semi-dry suit for added protection against the cold. Feeling inspired and raring to go? Check out our New Zealand travel guide and start planning your next diving trip! The Navy Frigate Canterbury F421 is now a shipreck located near Cape Brett in Deep Water Cove.